'Close Brothers with Differences' - The story of WWI combatant Edward Stephenson and how he nearly took up arms against his own brother in the aftermath of the 1916 Easter Rising. While the Irish Volunteers fought on the streets of Dublin during Easter Week 1916, many of their fellow countrymen, including the Volunteers who answered John Redmond's call, were engaged in the brutal trench warfare of the 'Great War' being waged in the fields of mainland Europe. Stories from the 'other' side of the 1916 Rising have often been lost and forgotten in the years since Irish independence. The mentality of 'us versus them' took hold for a period and many of the brave Irishmen who fought in World War I returned home not as heroic survivors but to be ostracised, their sacrifice forgotten. Our aim to tell the lessen known stories of 1916 certainly encapsulates these forgotten stories, and so we plan to tell as many of the stories from the members of the British Army as possible. If you have any relatives who fought with the Army in the period between 1912-1923, and wish to share their story, please get in contact with the project team at info@tilemedia.ie. 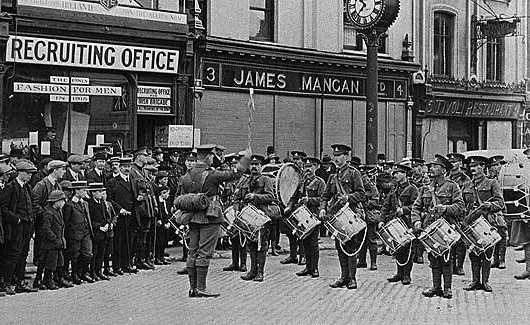 This featured 'Stories from 1916' podcast tells the tale of the 1916 Rising from a different angle, one that we rarely hear about. Albert Fletcher Desborough was one of the many Irishmen who signed up with the British Army during World War I. As a member of the 3rd Royal Irish Regiment, he was stationed at Richmond Barracks in April 1916. Early on Easter Monday, he had been preparing for a day out at the Fairyhouse Races, but instead he would find himself facing fire from his fellow countrymen on the streets of Dublin. His first-hand account of the week provides a fascinating insight into what life was like for the Irish soldiers on 'the other side' during the 1916 Easter Rising.